Pieces of Comet Halley Strike the Moon! Three meteoroids were seen hitting the moon last week — all of them possible pieces of Comet Halley! 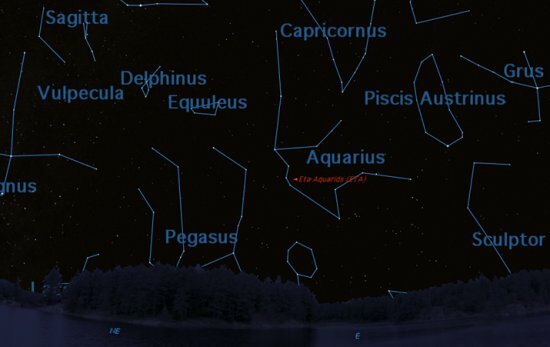 The Eta Aquariid — the meteor shower caused from Comet Halley, see post below — radiant was positioned so that almost the entire visible part of the moon was exposed to it. 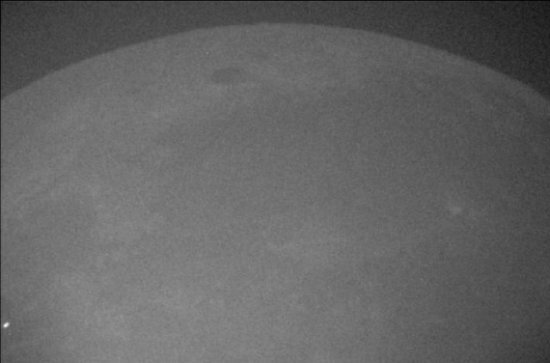 On the evenings of May 9-11, members of the Meteoroid Environment Office were out doing lunar observations and a meteoroid impact was seen each night. 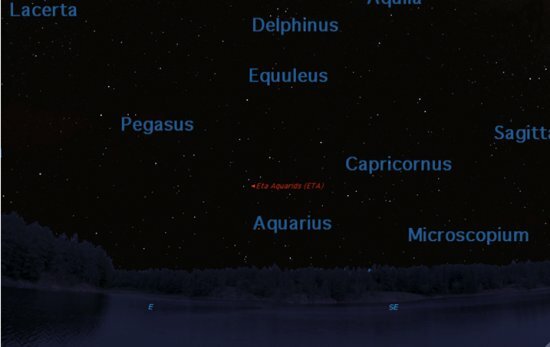 The peak of the Eta Aquariids was the morning of May 5, but the rate is still high and meteors associated with this shower were still seen last week in multiple cameras over Alabama and surrounding states. 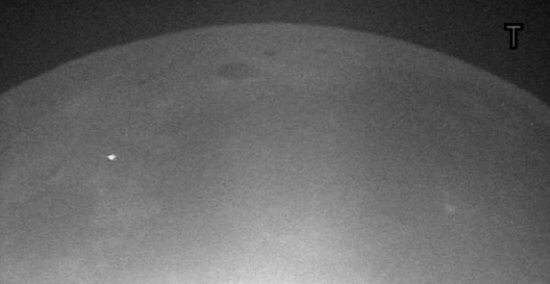 The following images are stills from the videos recorded those evenings; the impacts are seen on the dark portion of the moon. 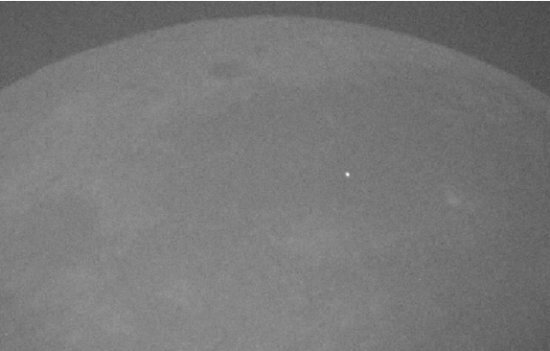 The movie below is the meteoroid impact from May 11 and after taking into account the brightness of the flash and the large amount of glare from the moon, this is one of the largest impacts we have seen to date! Author Marshall Space Flight CenterPosted on May 16, 2011 May 23, 2013 Categories UncategorizedTags Comet Halley, Eta Aquariid, Marshall Space Flight Center, meteor, meteoroid1 Comment on Pieces of Comet Halley Strike the Moon! 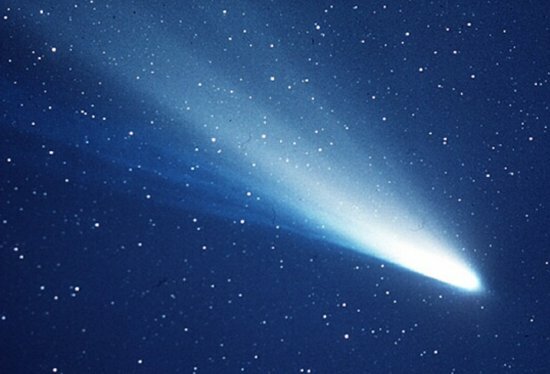 We at the Meteoroid Environment Office are hoping that you have clear skies on May 5/6 when we have the opportunity to see pieces of Comet Halley whiz through Earth’s atmosphere! Depending on your age, you may remember 25 years ago when people lined up for blocks to look through a telescope and get a glimpse of this popular comet. It will be another 51 years before the comet will pass close enough to earth for us to see it in its entirety, but the debris it has left orbit-after-orbit gives us a yearly show in the Eta Aquariid meteor shower. Unfortunately the shower will not be seen in all its glory from the northern hemisphere. Our southern hemisphere friends will get a better show than us, seeing up to 60 meteors per hour if the skies are clear and dark. The radiant (the point in the sky that the meteors appear to come from) will not rise as high for those in northern latitudes, but we still may be able to see 20-30 per hour. Very few meteors will be seen if you live upwards of 40 degrees N latitude. Don’t let the low numbers stop you, though! With the radiant being fairly low in the sky these meteors may be ‘Earth grazers’ which hit the atmosphere at a shallow angle resulting in very long and lingering trails. Earth grazers aren’t numerous, but they are memorable. To see these meteors look straight up if you are in the southern hemisphere, and straight up but slightly to the east if you are in the northern hemisphere. Let your eyes adjust to the dark, and be patient. Meteor showers are named after the constellation that their radiant is in, in our case the constellation Aquarius. 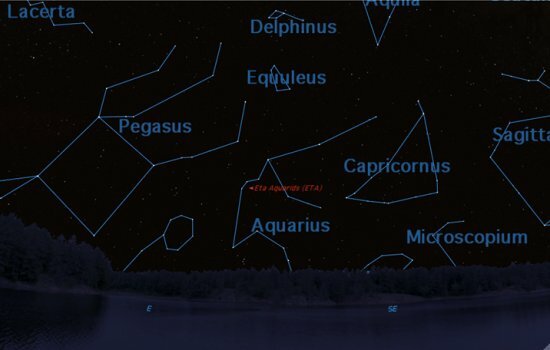 Specifically the radiant is in the ‘water jar’ near one of the constellations brightest stars, Eta Aquariid. The images below will help both southern and northern observers navigate the skies and locate the radiant (but don’t look directly at the radiant in order to see the meteors; look up!). 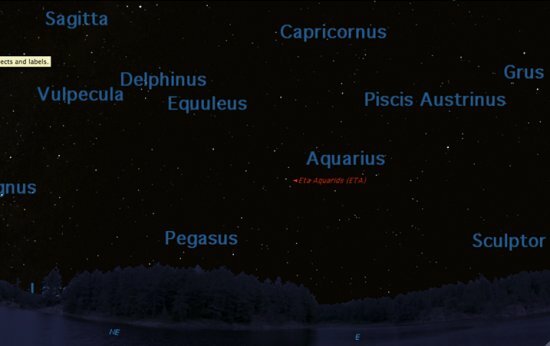 The Eta Aquariids are not only interesting because of their comet of origin. The Eta Aquariids have quite the history, being first recorded in old Chinese annals from the 8th century! It was’’t until 1868 that people suspected that Comet Halley and the Eta Aquariids were related, and not confirmed until 1900 by William F. Denning. Another interest to scientists is the complexity/inconsistency of the activity rates. May 4-6 is always the main peak, but other maxima are frequently seen around this time. This unusual activity is likely caused by thick and thin filaments within the stream that Earth passes through. These filaments could be from planetary perturbations as well as a refreshing of the stream by comet Halley. One sure thing is that the Eta Aquariids are one of the oldest known showers, yet still one of the most interesting to study. 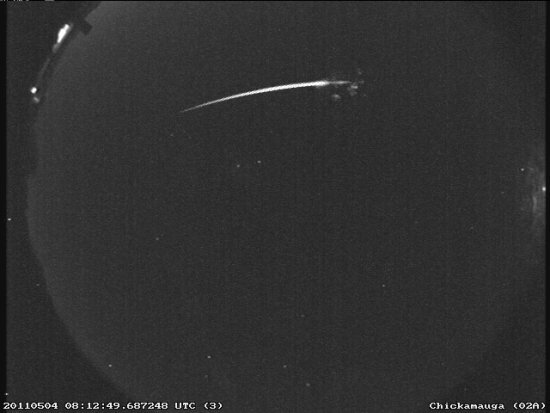 Since you are going to be out anyways, why not check out what else is in the sky! Saturn will be setting on the opposite side of the sky as the Eta Aquariid radiant and in the early morning you may be able to catch a party of planets; Venus, Mercury, Jupiter, and Mars (in that order) will rise in the east just before the sun does. Using a small telescope or binoculars may aid in seeing the planets. Happy viewing! (Starry Night). Constellations as seen from Brazil, 4 am local time (UTC-3 hours) May 6. First time recorded: 8th century by the Chinese, though the connection to Comet Halley wasn’t made until1900. Courtesy of Rhiannon Blaauw, NASA’s Meteoroid Environment Office, Marshall Space Flight Center, Huntsville, Ala. Author Marshall Space Flight CenterPosted on May 5, 2011 May 23, 2013 Categories UncategorizedTags Eta Aquarids, Halley's Comet, Marshall Space Flight Center, meteor shower, meteors17 Comments on It&apos;s Raining Comet Halley!